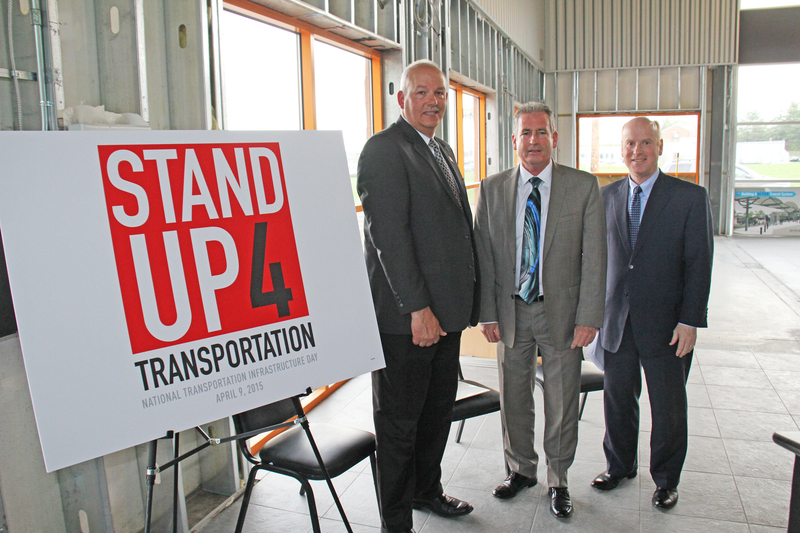 Local leaders from the bi-state area joined more than 350 organizations across the nation today to celebrate Stand Up for Transportation Day. The event was sponsored by the American Public Transportation Association to encourage the federal government to commit to a long-term funding plan for transportation infrastructure. Bi-State Development Agency President and CEO John Nations, Bill Schnell from the St. Louis District of the Missouri Department of Transportation and St. Louis County Councilman Michael O’Mara talked about how long-term, federal support benefits local transportation infrastructure and the local economy. 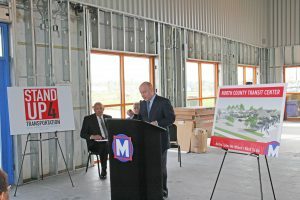 The St. Louis event was held inside what will become Metro’s newest transit center, the North County Transit Center, which now under construction, in Ferguson, Missouri. The $5.5 million transit center is scheduled to open in 2016. Four point three million dollars of the project costs will be paid for with federal money. C. Rallo Contracting Company is the prime contractor. The Bi-State Development Agency operates the Metro transit system for the region. 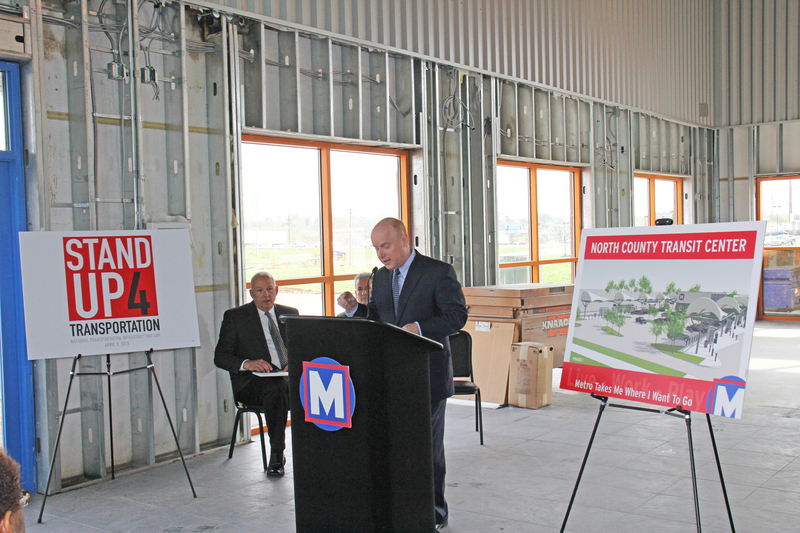 The new transit center will serve one of Metro’s fastest-growing public transit markets and accounts for 19 percent of MetroBus and MetroLink ridership. “While we have been fortunate to obtain limited federal funding for some of the region’s most critical infrastructure needs, the lack of a long-term transportation and infrastructure plan at the federal level imperils our abilities to plan for the long-term needs of our region and imperils current and future opportunities,” Nations said. At Metro transit, federal funds have helped move transit forward for the bi-state region in numerous ways. From preserving the historic Eads Bridge and to planning for a new MetroLink station in the Cortex district to investing in new transit vehicles to creating bike paths in St. Clair County, federal funding has helped the entire region by improving the quality of life and economic opportunities for residents.